Have you ever cooked bacon in the oven?! It used to be that I’d cook a few pieces of bacon from the package in a skillet, occassionally the microwave if I was in a hurry. But this growing brood of boys of mine means I’m making a full package every.single.time. It’s pretty simple. 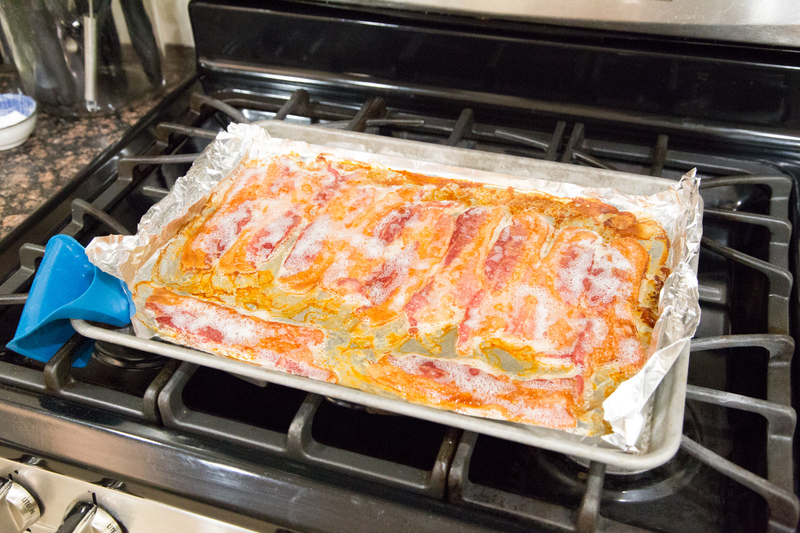 Place all the bacon onto a piece of foil that is nestled into a baking sheet with a rim. Set the oven temp to 400. Cook for 23-25 minutes. Give it a check to see if it’s cooked to your preference. Continue cooking, checking every 2-3 minutes, until it is cooked to your liking. Every oven is different and everyone likes their bacon cooked how they prefer! It will “crisp up” a little as it cools and the grease is dried off. Use tongs to set aside onto plate with napkins or paper towel to drain the grease. No-mess cooking the bacon! ZERO GREASE ON THE BAKING SHEET! ENJOY your perfectly cooked bacon! Find more helpful Cooking Tutorials from $5 Dinners here. 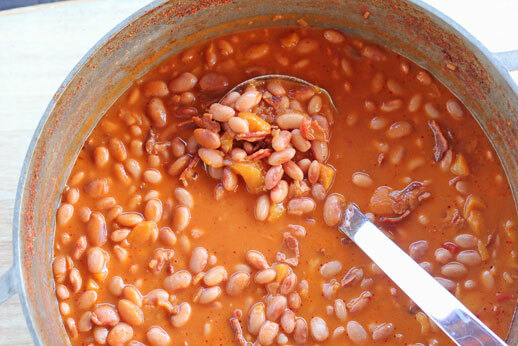 Follow $5 Dinners board Cooking Tutorials and Kitchen Shortcuts on Pinterest. I cook my bacon in the oven, but use the broiler pan. That way the grease drips through the slots and the bacon gets good and crispy. The bottom part of the broiler pan catches the grease. 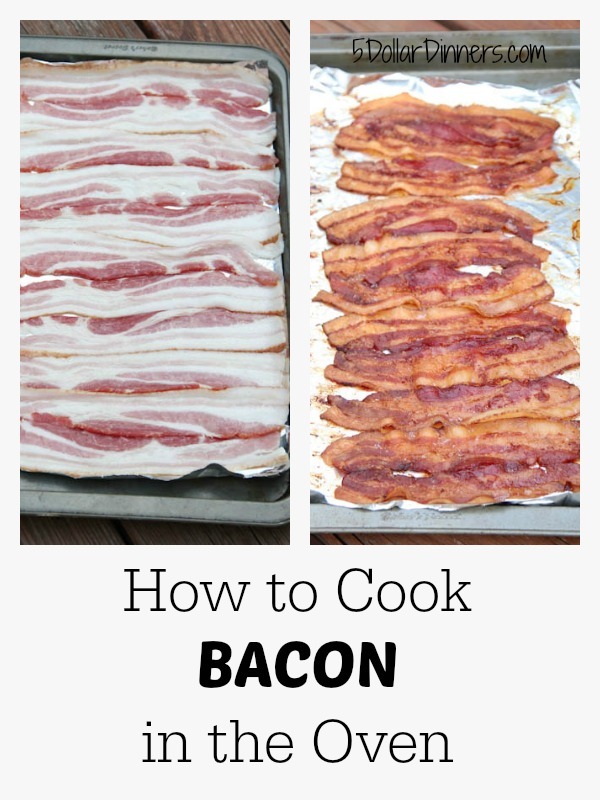 I’ve cooked my bacon like this for a couple of years now & love the convenience. There’s no bacon grease splattered all over the stovetop. I’ve never tried lining my pan with foil, but sounds like a good idea to try next time. I tried cooking it in the oven once but it stuck to the pan HORRIBLY …. maybe the foil helps with that? Anyone else ever had it stick? Do you flip it like when you fry on the stove/griddle or just leave it one one side the whole time?? You don’t need to flip it. We line the pan with tin foil and cook the bacon on a rack. It comes out perfect every time! I’ve cooked ours like this for years sometimes I’ll sprinkle with brown sugar too! I have done this method for a couple years with a few tweaks along the way. I use parchment paper unless I want to reserve the bacon grease, then I use a broiler drip pan. I’ve tried making bacon in the oven but it never gets as crispy, just chewy 🙁 I don’t know what I might be doing wrong. Any suggestions? Do you start with a cold oven? Try that! Have you tried a baking rack? That seems to crisp it up. Yes, I have! I like them a little better this way! I put mine on a cooling rack over a large rimmed cookie sheet so it doesn’t cook in the drippings. Put in cold oven, set oven to 375* and check at 18 minutes. Watch closely after that until it gets to your desired doneness. I find that there’s very little shrinkage and it crisps up beautifully! I don’t prepare bacon often, but the oven method is what I prefer when I do. I like the convenience of preparing a large quantity of bacon (whole package) with less effort on my part. In my case, the added advantage to the oven method versus stovetop frying is that I don’t eat the cooked bacon while waiting for the next batch to fry. Here’s my trick with the oven method: I use cooling racks (the ones used for cookies) in/on the baking sheet. This keeps the bacon out of the grease, and the bacon comes out flat and extra crispy – the way I like it. I typically use two baking sheets side-by-side for a whole package. 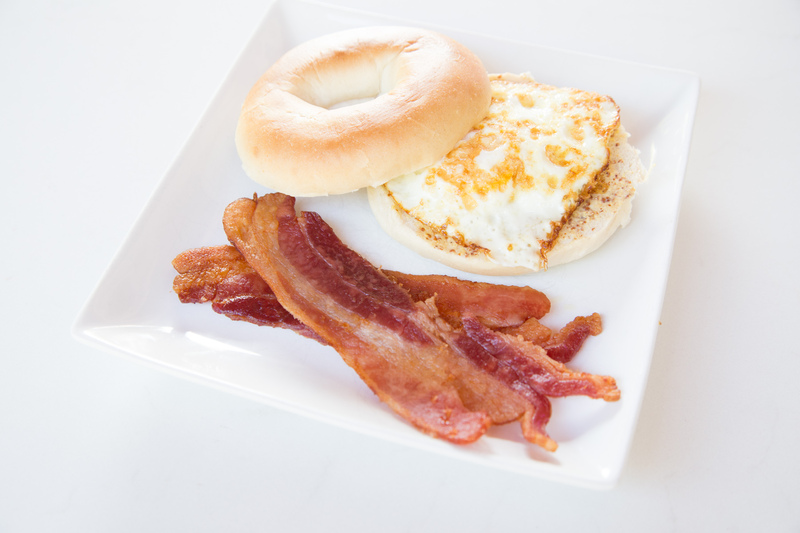 Eat as much bacon as you want at the time and/or reserve for later use. Store in a ziplock bag or whatever. Good for sandwiches. You can also make your own bacon bits to add to other various recipes (potato salad comes to mind). AND – I reserve the bacon grease. I pour it through a sieve lined with a paper towel or a coffee filter, and then store it in the refrigerator. I use it when I fry eggs mostly. A little bit goes a long way, and I get the bacon flavor without having to make a bacon mess. It is good for frying potatoes too – bacon grease reaches a higher temperature than some other oils, and the potatoes get extra crispy. I second that motion. Bacon grease is the food of the proverbial gods; great for sautéing green beans, eggs, any sort of veggie. I keep it in a container in the fridge. We cook it @ 400 degrees for 30 min. 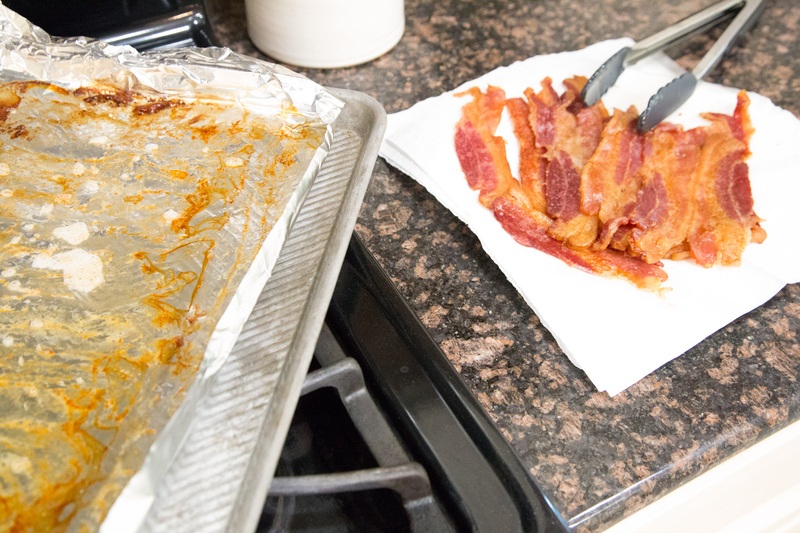 (Put in oven while preheating) we also lay the bacon on a cooling rack with a foil lined cooking sheet underneath. I’ve definitely done this whenever I had to cook bacon for many at home. Though it is so tasty, I try not to have it all the time. I like mine like yours are pictured (not extremely crispy), but if you wanted to go for a crispier bacon you can put them on a cookie cooling rack and stand the rack on your baking sheet (all the fat will fall). My problem is my cookie sheets are getting stained with bacon images and yes I do line them with foil. Any ideas how to correct this problem and clean my baking sheets? it’s the metal in your cookie sheet, it doesn’t affect the cookie sheet so don’t worry about it. pans are so cheap if you really don’t like the look, then just keep one separate for bacon only. Non Stick pans shouldn’t discolour. older ones that are metal will have the affect and there’s nothing you can do about it. I put the oven on broil, it is a lot faster, we like it chewy, but give it a few more minutes and it is crispy, whatever you like. I have a glass 13x9x2 pan that I only use for bacon, so it has some burn marks that will not come out, but the tall pan keeps from leaking. Sometimes I give the dogs a treat by pouring the bacon grease over their dog food, or use it to make scrambled eggs. This is how I do bacon. For an extra treat I get thick sliced bacon and slow roast at 275 for 45-1hr. 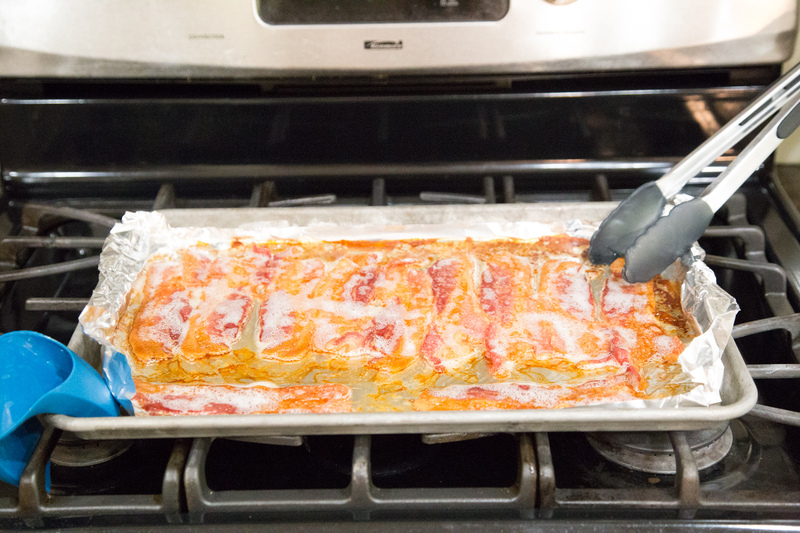 At 40 minutes I pull it, drain the grease off the foil, and drizzle it with real Mae syrup. Slow roasted candied bacon is the best. We use the cooling rack over a foil lined baking sheet with sides, but I also spray the cooling rack with nonstick spray, otherwise it is a pain to clean. As far as the “burn marks on the pan” several people talked about, I just use heavy duty foil that is 18 inches wide. I make sure the foil covers the whole pan and wraps up around all the edges. Once the bacon is cooked and the pan is cool, I carefully take the foil out, making sure not to spill the grease contained inside, and drop it in the trash can. I don’t even have to wash the pan it was in – no mess, no stains, easy. 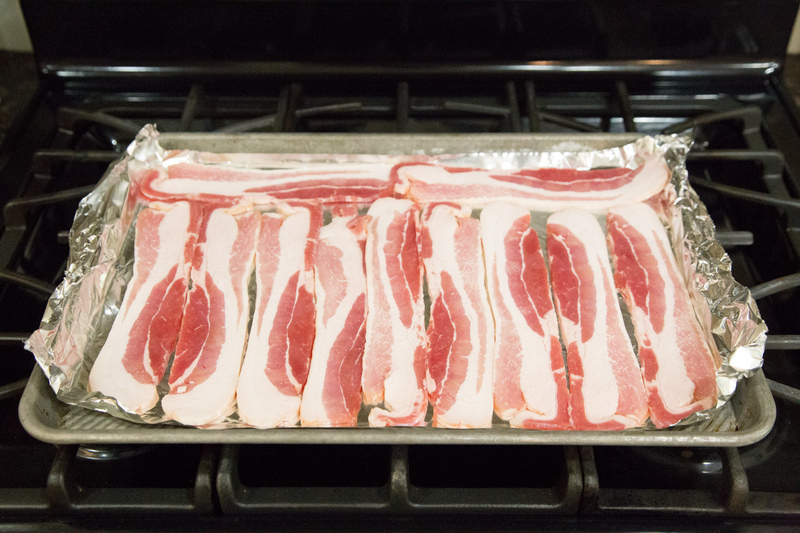 I’ve cooked bacon on a sheet pan for years! I put the bacon on a cooling rack on the cookie sheet though. The grease drops through the slots! I start in a cold oven, 400 degrees and 20 minutes. A few minutes before I flip them and then keep them in the oven as needed. Delicious!